Two car accidents killed pedestrians this weekend in Lowell and Townsend, the latest in a series of injuries and deaths in the past month. A 50-year-old Lowell man walking on West Sixth Street was killed early Sunday morning in a hit-and-run pedestrian accident. The previous day, a 57-year-old Townsend man was killed on Wallace Hill Road in that community. On Sept. 9, a 38-year-old man walking with his girlfriend’s young daughter was killed when he was struck by a Dodge Ram pick-up truck in Whitman. The 4-year-old was also hit and survived with serious injuries. In the past month, pedestrians have also suffered serious injuries in car collisions in Northborough, Salem and Woburn. Sidewalks. Use sidewalks as much as possible. Understand the law. You have the most protection in crosswalks and intersections with “Walk” signals. Use these as much as possible. Be patient. Resist the urge to cross the street before a “Walk” signal lights. Pay attention. Do not talk on your cell phone or text while waiting to cross the street or when walking through traffic. Wear bright colors. When walking or running at night or in the early morning, consider wearing a neon vest and carrying a flashlight. Time of day. Be aware of when pedestrian accidents often occur. On weekdays, they are most likely to occur between 4 p.m. and midnight, according to the National Highway Traffic Safety Administration (NHTSA). On weekends, the majority occur between 4 p.m. and 4 a.m.
Shopping areas. Pedestrian accidents can happen in parking lots at shopping areas and schools as well as on streets. Walk slowly and watch for cars pulling out of spaces. Eye contact. When you are uncertain about what a driver is planning, attempt to make eye contact. Crosswalks. Pedestrian have the right of way. They have the most protection in crosswalks and intersections with “Walk” signals and green lights. You must stop before the crosswalk and not on it, even if no one is crossing it. Slow down. Slowing your speed and looking out for pedestrians and bicyclists are the best way to avoid a car accident. No texting while driving. This is against the law in Massachusetts and reduces your ability to react to other drivers, bicyclists and pedestrians. Avoid other distractions. Limit distractions, such as talking on your cell phone, grooming and extensive use of the GPS and maps. Change your travel route. 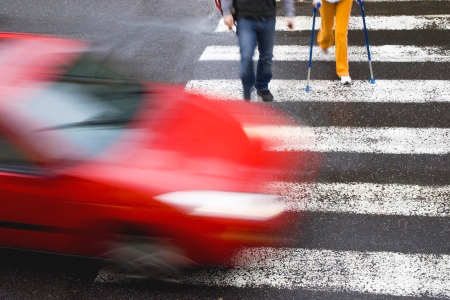 Ask yourself if you can change your travel plans to reduce encounters with pedestrians. Maybe you can avoid school zones when classes are in session or dark roads when runners and walkers may be traveling. School zones and buses. Drive slowly. In Massachusetts, the speed limit for school zones is 20 miles per hour. Remember you are required to stay 100 feet behind a stopped bus and cars are not allowed to pass other cars stopped for a school bus.